I've been planning these two paintings for some time now, working out the design, size and background. The raven in Blood Moon Offering is from a great photo by Gordon Vanus, taken in bright daylight with blue skies ( I added the sunflower and Ken took the moon shot). 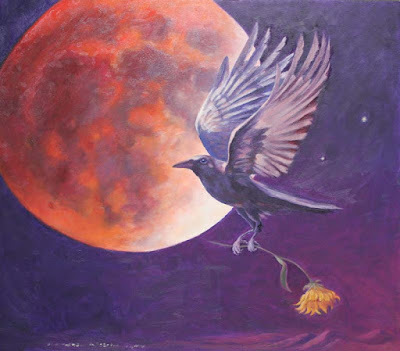 I was still unsure as to what the background on Blood Moon Offering was going to be, but I had already painted the raven and the sunflower onto the canvas in gray tones when the Lunar Eclipse happened the evening of Sept 27th. I watched the moon transform herself as Ken took picture after picture on the tripod, and soaked up the deep mystery of the night sky. The next morning, I knew exactly what to paint. Had to change the colors of the raven from bright daylight to deep, dark night. Used a very limited palette of alizarin crimson, ultramarine blue in the night sky, with a touch of ochre brushed into the distant mountains, far below. The moon has red and yellow cadmiums along with the purple from the sky. No tube black in the raven, just deep purples. This piece just got juried into Masterworks of New Mexico which will exhibit starting April 1 in Albuquerque, NM at Expo New Mexico. 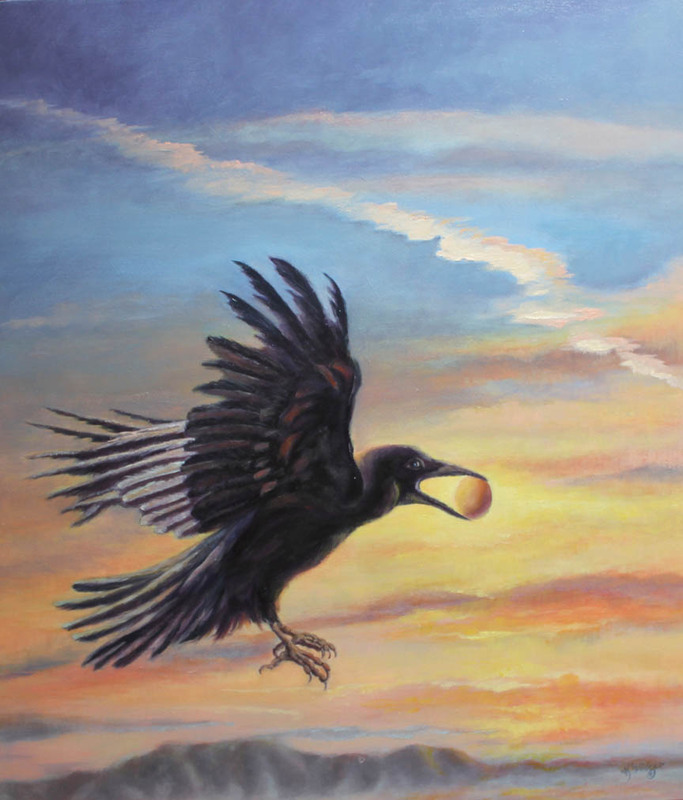 The Egg Thief is a soft morning sky in summer with ultra and cerulean blues, quinacridone magenta and cad yellows. No tube black in this raven, either. This raven pic shot by my husband, who set up a "blind" and waited patiently for hours on several days, "baiting" our resident raven with eggs in order to get the shot. Actually, he took a whole video of this raven, landing on a post, picking up the egg, dropping it then catching it in his beak and taking off, all without breaking it! Quite amazing to watch! How strong, yet how precise and controlled their beaks are! He knows my husband and comes to get his egg on a regular basis, now, less wary but still unwilling to have his picture taken, like most ravens. You have to pay your models!